As textile designer I exercise several techniques. When living in Iraq I already applied patchwork and hand painting on fashion. 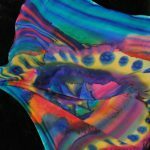 I learned much more fashion textile design techniques when I lived in Sweden and the Netherlands. 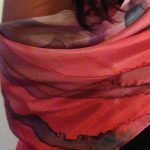 I learned to paint on silk, weaving, knitting, lasering, mixing and connecting different textiles, screen printing and felting. The Academy in Maastricht, Malhia Kent in Paris and the Textile Museum in Tilburg were great places to experiment and to practice the fashion textile design techniques with different materials. 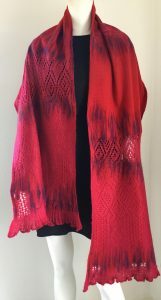 In The Netherlands I learned a new textile design technique to mix for example lace and wool to my designs. It turns out to be a wonderful technique and it can by applied using different materials. I am a specialist in using this technique. 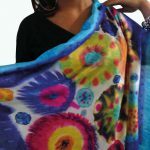 It can be used to connect different kind of textiles even old pieces of clothes in a very special way with a great esthetic effect. I have come across customers and fashion designers who want to apply it in their designs for dresses. 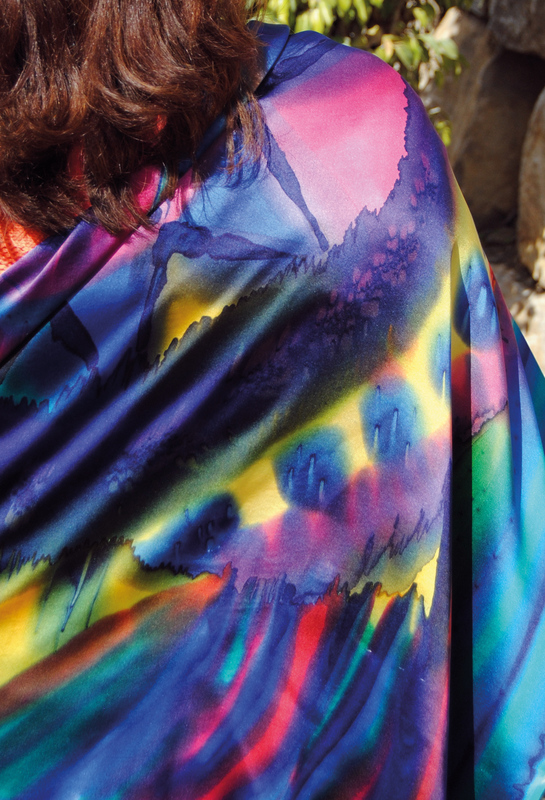 I show you the effect on some shawls in the pictures above. 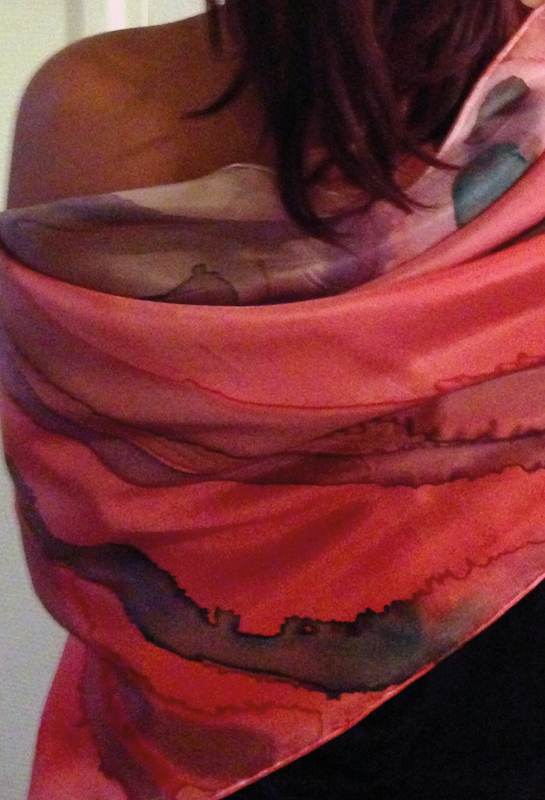 The fashion industry is one of most polluting industries so where possible I reuse materials when designing shawl. For me the red shawl is special within that context. I subscribed in 2017 to the design contest Textiles Reinvented of the Textielmuseum Tilburg. Related to the exhibition Earth Matters designers were challenged to reuse textiles from old clothes and create new designs. The red shawl was my contribution. Pieces of an old shawl, a pullover and left overs from a French design house are connected together with old pieces of wool with fitting colours. 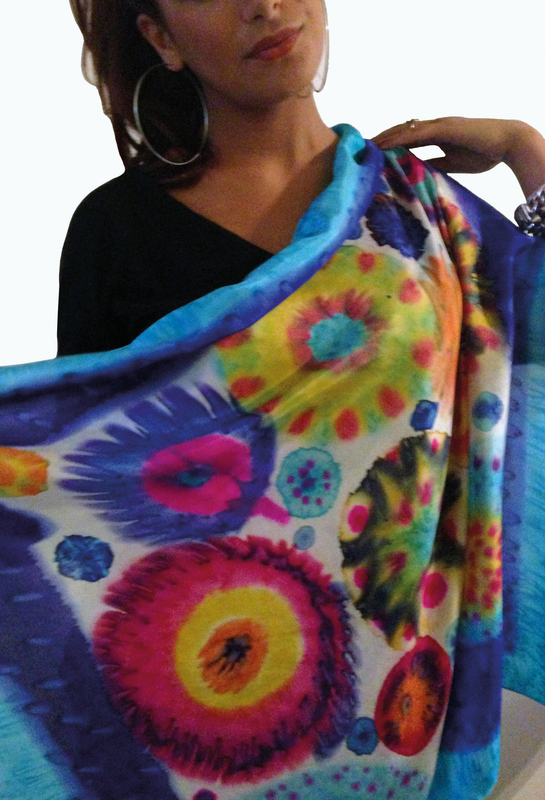 The result is a fully new luxury exclusive shawl. Wouldn’t you want such a new creation and contribute to the environment? 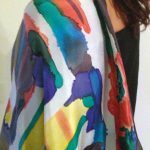 If you are interested in sustainable fashion textile design or do you want to buy a tailor made piece of sustainable fashion? Contact me and I design a dress or shawl for you that fits your character perfectly reusing for example your own textiles or buy your dress, cape or shawl online. When living in Sweden I still carried in my heart the culture of my childhood. The influence of the Scandinavian environment grew bit by bit. 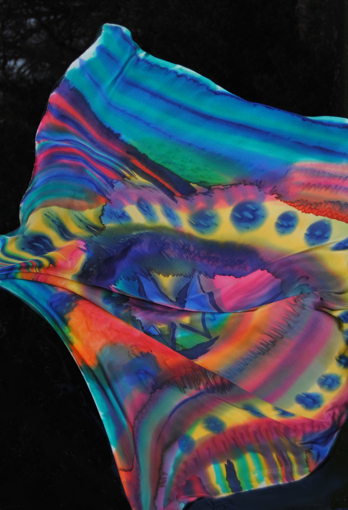 However, I missed the heat of the sun and the whirling use of colors as I carried it in me. 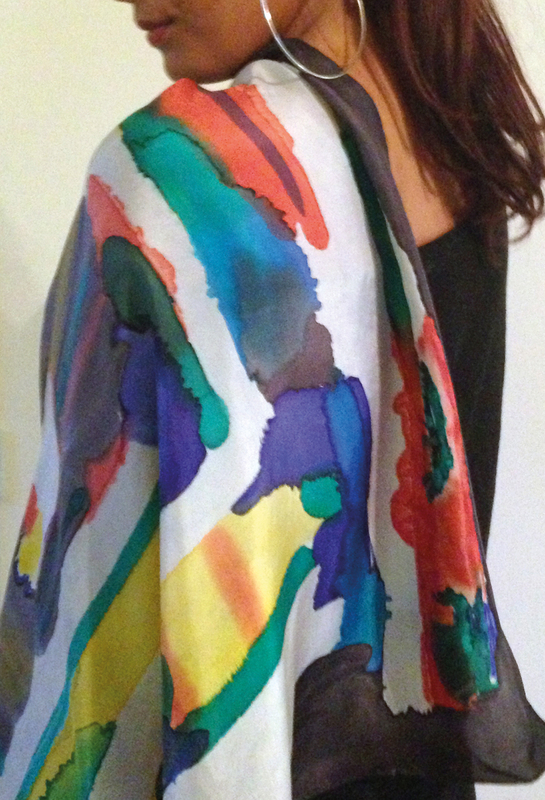 These memories and that feeling inspired me to design the colorful silk shawl collection. 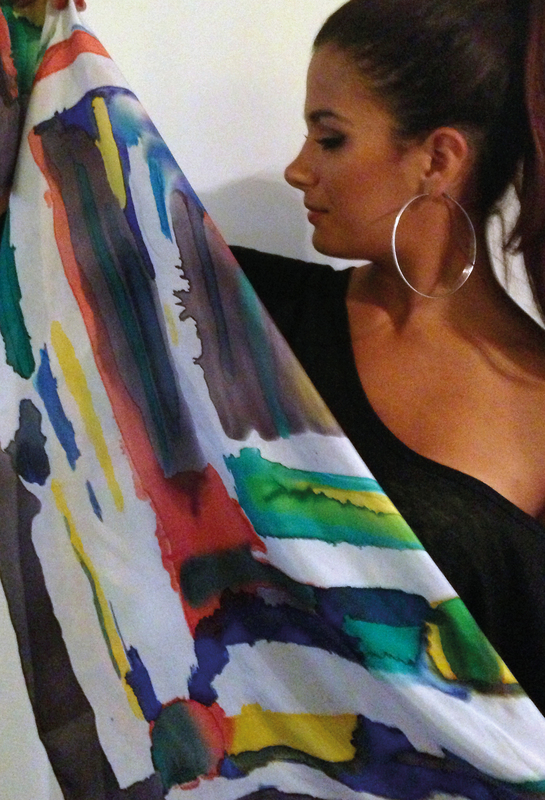 I have a long experience in fashion textile design. 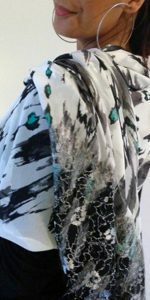 Already in the country of origin I was textile designer in the Iraqi Fashion house. I also had my own company and sold to many important customers tailor made fashion like dresses and shawls decorated with different material using different techniques inspired by Sumerion, Assyrian and Islamic art. 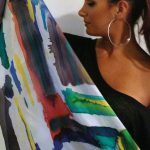 In the Netherlands I learned a number of new techniques as textile designer for fashion and home decor during my educution and got my bachelors degree from the Maastricht Academy of fine art. My internship at Malhia Kent in Paris was great. I learned what it meant to be part of a design house and deliver designs to haute culture fashion companies like Chanel. This experience is very valuable and I use it daily now to work with my fashion loving customers. 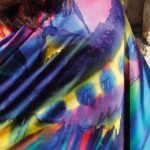 So, if you want to buy an exclusive and unique shawl or you want a dress for a special occasion. You want to have it designed exclusively for you, perfectly fitting your character. Also the accessoires perfectly fit, just get in contact with me. © 2019 HALLE DESIGN. All rights reserved.